My lawn guy showed up today and gave my lawn its first cut. 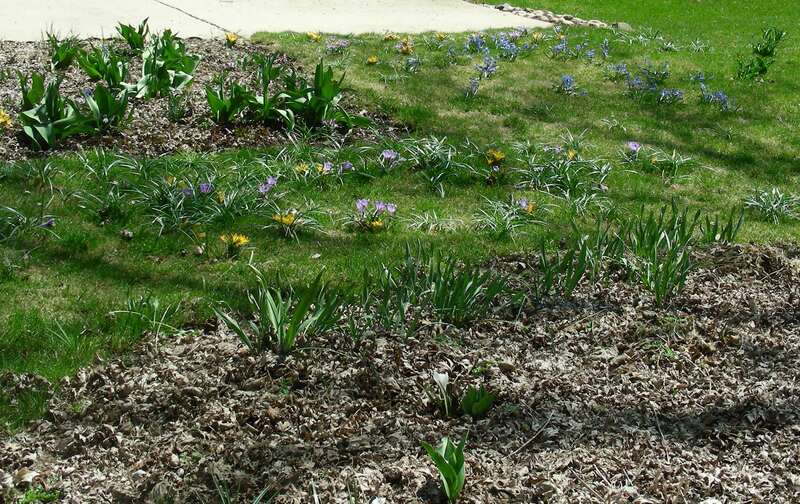 When he cut my grass, he also cut all the crocus and squill growing in a big patch of the lawn. I have multitudes of little bulbs in my garden beds and many hundreds more planted in the lawn. Thanks to the hard winter we just had, not many came up this year. I suspect they died. Most of the ones that made it don’t have blooms. I was just happy to see that some survived. Only a quarter or less of my usual made it. Which for me means the lawn man mowed down something like 200 little plants. The worst part about it is that bulbous plants use their foliage to photosynthesize and store that energy inside their bulb. That stored energy is what they use for all their life functions. It takes a tremendous amount of energy for a plant to bloom. Bulbs use their stored energy from the year before to come up and bloom the following spring. Then they extend their foliage even further after the bloom dies, replenishing their stores in their bulb, to tide them over until the next year. This is why we’re always advised to not cut the foliage off of our daffodils and such, but let them die back naturally. They’re storing energy. My crocus were bloomless because they used too much of their stored energy just to survive our brutal winter. They didn’t have enough energy to bloom. It was too cold, too long – the ground was too frozen, too deep – and most of them didn’t have enough stored energy to make it through. Those that did, really needed lots of energy gathering time this spring, if they had any hope of living through next winter and perhaps blooming and procreating next year. I was willing to give them this time, letting them grow for weeks on end despite the grass surrounding them. My lawn man was not. What will happen to them now? Even if they bounce back and grow some more, and the lawn man doesn’t mow them again (if I have to lie out there to prevent it, you better believe he won’t! ), will they store enough to live through next winter? Who can tell? Only God knows that answer. I went outside and cried over the massacre. The lawn man saw me and was very apologetic. I’d told him not to cut there and he had misunderstood. To his credit, I realize he’s just trying to get a jump on the season, to make a living. Everyone’s got to make a living. If you ask me, his coming this early (when clearly no-one else is cutting their grass yet) is an act of greed. But I can’t really blame him for being overly opportunistic. It’s not like I’m immune to being opportunistic myself. Human nature being what it is. No, I blame myself. You can say I’m making too much of it, but anyone that knows me is aware of my personal attachment to plants. I am not ashamed of my belief in their little souls! To me, they are every bit as much a part of the intelligent web of life as you and I are. And I feel like I let my little friends down. I didn’t watch the lawn man closely enough, or didn’t explain to him in terms he could understand (he doesn’t know what crocus foliage is, apparently). My crying had as much to do with sorrow for myself as for my crocus. Crocus, you see, is my favorite flower. I wait eleven months every year to see them bloom for a few short weeks. I love to get up close and watch the bees hover in the tiny flowers. I even love their bare foliage. So, naturally, I have a stronger than normal attachment to these little plants. Of all the flowers in my garden, they are my most beloved. I ran inside, threw myself on my bed, and had a good, long cry over the cut crocus. A friend of mine was unlucky enough to call me at the tail end of my crisis. She got an earful of my tears. Lucky her. She also advised me to go back outside and tell my crocus (what was left of them) how I felt. Make amends, and let them know I loved them. So I did. It was good advice. A bit of closure. I’m still sniffing as I write this, four hours after the fact. Probably will be wiping my tears off and on all evening. I prayed to God to save His little plants. I like to think he feels for all of his creation. Right down to the tiniest little crocus. I look outside my window, and I can see storm clouds gathering, and the sound of thunder speaks from a distance. Perhaps God is crying too. I totally get it. I know how you are with your plants. I remember you telling me how you started those little guys inside and then moved them outside. I hope he knows what hostas are. I knew you’d get it. You lent me your ears many a day when I’d go on and on about my plants. I think of our conversations together every time I post another plant pic on Facebook or PlantInTheSun blog. Thanks, Barb!